Head to Egypt to excavate the desert sands for a chance to uncover ancient relics and plenty of big money wins! Click here to play! While you're searching the sands for buried relics, keep a close eye out for King Tut's sarcophagus. This highly valuable golden coffin is the highest paying symbol in this 3 reel game and will bring in up to 2500 coins if you can spin three of them across the single pay line. You'll also want to look out for the pyramids. It's rumored that they house treasure beyond belief, and they'll bring in up to 240 coins if you can get three of them across the pay line. Also keep a watch out for BARS while you're digging through the sands. These classic slot symbols will bring in 90, 60, or 30 coins if you can spin three triples, doubles, or singles across the pay line. There are also scarabs hidden amongst the reels. Three of these sacred beetles will get up to 30 coins. 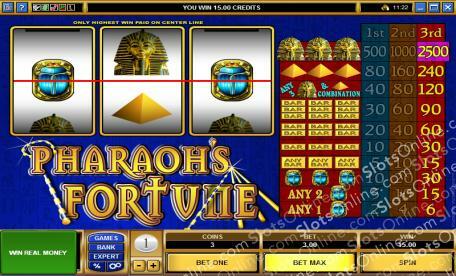 This classic slots game will accept a maximum of three coins. Be sure to wager all three in order to activate the highest pay table and ensure that you're bringing in the biggest wins with each spin. Search the golden sands of the Egyptian deserts for a chance to bring in plenty of valuable treasures!